Running almost next to the Sea to Sky Highway is a large tributary of the Squamish River. Cheakamus River offers seasonal fishing for salmon, steelhead, trout and char for anglers in Vancouver and Whistler. In summer 2005, this river suffered a chemical spill that caused extensive damage by killing off juvenile steelhead, large bull trout and other smaller fish species. The system has slowly recovered and fishing is in fact not too bad at times. It is a good spot for anglers who simply want to get in touch with nature, catch and release the odd fish. The main access to the lower section of the Cheakamus River is from Squamish Valley Road. When driving north on Sea to Sky Highway, turn left onto Squamish Valley Road. Continue until the first bridge. Accessing the river can be done from here. The road forks into two after the bridge. Continue on the road to the right until the second bridge, where additional access is available. The upper sections of the river near Whistler can be accessed along Sea to Sky Highway. Cheakamus River is not really fishable during the summer months, due to freshet from snow melt on nearby mountains. In years with low snowpack, the river might be fishable by mid August, when pink salmon are found during odd years. The salmon fishing season takes place from September to December. Both coho salmon and chum salmon are found in this system. Bull trout, cutthroat trout and rainbow trout are found at times from late fall until early spring when freshet begins. Winter steelhead is typically good between March and May. In the upper sections of the river, small trout and char are found during late summer and early fall, when dry fly fishing is possible. Salmon can be targeted on the Cheakamus River by float fishing. Because there is an year-round bait ban, you can only use artificial presentations such as wool, unscented plastic eggs under your float. Lure fishing with either a baitcasting or spinning rod is also a great method for salmon fishing. Find a large pool or slow run where salmon may hold, cast and retrieve a large spoon or spinner can easily trigger a bite. For trout and char, float fishing with small egg imitations works great from late fall until mid winter. If you prefer fly fishing, then try using large patterns for bull trout. A light spinning rod can also be a lot of fun for trout and char, but it is possible to encounter a large bull trout or steelhead at times so best to avoid it. 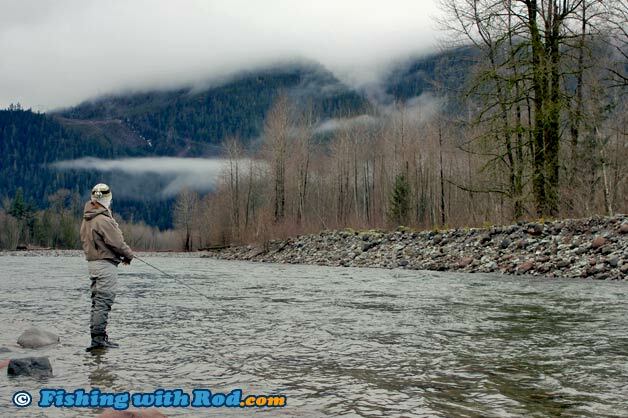 Winter steelhead fishing is usually done by either float fishing or fly fishing. Gooey bobs, pink worms, Colorado spinners are all excellent choices for targeting steelhead under a float. Experienced fly fishermen can enjoy targeting these large chromers with a two hander. Cheakamus River is located in Region 2 in the British Columbia freshwater fishing regulations. The regulations are often different from one season to another, so please check them before your trip. Wildlife are abundant in the Cheakamus River valley, so explore with care to avoid confrontations and accidents.